I recently completed this flower arrangement which I named it Spring Chic. It reminds me of spring time that is slowly but surely approaching us. Although I know this is not truly the case as many of the countries in North Asia are experiencing a sudden big chill and the weather in many of the countries are at a new low. Fortunately or unfortunately, depends on how you see it, Singapore isn't affected by it really. Over here, I'm only experiencing more windy days, but the temperature hasn't dropped lower. The spring chic dollhouse miniature flower arrangement is available here. If you are still reading this post, what I'm going to say next isn't going to be miniatures related. But I had a bit of shock and am feeling a bit sad today. My mother fell at home today. But thankfully I was at home at that time. By the time I went to take a look, she was sitting down and applying some medication to her eye socket area which was very swollen. She also cut her lip. I was very shocked by that, and I insisted to bring her to the doctor right away. I think she was a bit embarrassed to be walking out of the house in that state, but I did not want to delay any further as I wasn't sure if she had any serious injuries. I also think she was in a bit of a shock. We went right away in a taxi and luckily I managed to grab the first spot for her at the doctor. The doctor examined her and said it's hard to tell if she had any fractures but he doesn't think there is any. So we have to monitor her condition for the next few days to see if she has any pain, vomiting, headaches etc. She was prescribed with swelling medication, pain medication and a mouth gargle. The doctor also asked that she put an ice pack over her swollen area to reduce the swelling. So that was my priority when we got home. Even though she's in a bit of shock then, the doctor didn't want to prescribe any medication for that as it will cause drowsiness. So it is something she had to cope and handle naturally. I made her chamomile tea as I knew it helps with anxiety and panic attacks. It was her first time drinking that and I think she is open to anything that helps to calm her down. She finished the entire cup! After an afternoon of icing, her swelling has reduced a lot. But I know she's still a little self conscious with her looks. I know she doesn't want to go out of our home for at least a week until the bruise and swelling is completely subsided. She doesn't want others to think she was being physically abused. I think as our parents get older and more frail, we will experience and witness things that reminds us that they are indeed not as young and mobile as before. While I was helping my mom with the icing, I had a sudden flashback of how my mom took care of me when I was young and broke my nose accidentally in school. She took me to the clinic and then hospital, and also massaged my broken nose gently with the hard boil egg. Now it is my turn to care for my mother. I cannot help but feel sad when I see my mom with a swollen bruised eye. But I did not shed a tear when I was with her, because I had to be strong to be the caretaker. This is absolutely perfect if you have a table, cake display shelf and just want to have a lovely display. I wanted to blog about something entirely different today. Actually introversion and public speaking are two big subjects which I ought to break it up to talk about more. So today, I'll want to focus and share my thoughts on public speaking. Recently, I was presented with a public speaking opportunity. Yes it's something different from what I do altogether, and surprisingly I was excited about it. I was excited because it's truly a public speaking opportunity, and not a hands-on crafting demo thing. If you had presented that idea to me when I was in my 20s, I'll freak out and say no. It was a combination of stage fright, disliking being in the limelight and lack of self confidence. The truth is, I have numerous opportunities to present when I was younger, but they were all work related topics and honestly, I have always hated it. I hated it because the topics (usually technical) bores me to death. I never really felt for the subject strongly which naturally led me to not liking public speaking or presenting altogether. But coming back to this recent opportunity...Ultimately, things didn't work out because they wanted me to talk about a different topic which I don't care about. If I find the topic boring and it doesn't inspires me, I am not motivated at all. I have actually given some serious thoughts about this. If I was given the platform to talk publicly, and I can choose what I wanted to talk about, this is what I wanted to share: inspiration, passion, the creative journey and even business fundamentals. These are the topics that I care about and feel strongly for. I have also garnered quite a few stories from my own creative journey all these years to share. I don't want to talk about the "nuts and bolts" of setting up a business because these are things that you can find answers on the internet if you really spend some time doing research. As I reflect on the recent incident, I never imagined being presented with a public speaking opportunity. But I think from the few minutes of exchanges I had with the few guys, I must have impressed them to a certain extent. I'm going to save those personal stories and maybe in the future where there is an opportunity to talk about them, I'll like to share. I want to use the public speaking platform to share those, because it would create the most impact that way. My sweet customer said this about my newest bouquet :) It made my day. On another note, I'm going to try to make a new simple project this year. This would probably be more challenging than the other projects in the past as it depends on other parties as well. But every project starts with a single first step and yes I've made the first step which is email! I hope that the challenges and obstacles that come along the way will not be too difficult for me to handle. But I think this is a good challenge, and I'm welcoming it. This will be my project for 2016! I'll share more when I have more news. 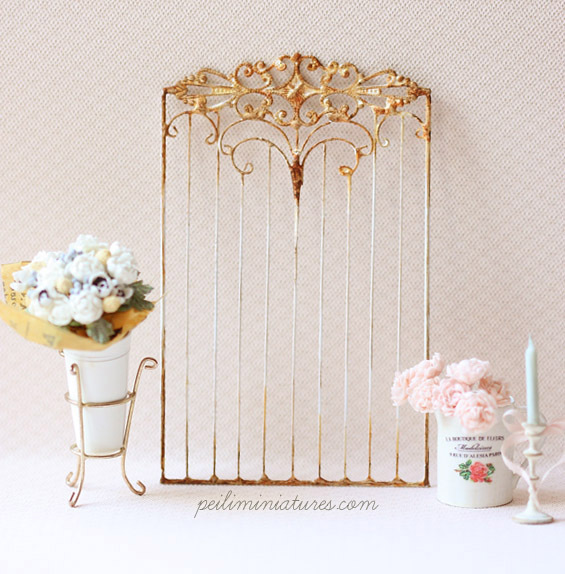 I am delighted to finish a new wrought iron grill design in 1/12 dollhouse scale. This time round, I kept the design fairly simple and clean, but still it has very intricate lines. The flowers are actually a special request from a long time customer in France. She fell in love with the white and blue color scheme and wanted a bouquet in those colors, wrapped in soft aged newspaper. I'm going to make another bouquet someday soon. But meanwhile, I'm experimenting with another bouquet. And of course a shot of the cake on my hand.